Cytherea is an incredibly stunning peony, one that will truly shine in a bouquet. The buds are enormous, brightly coloured and look just like poppies on steroids while blooming. The open centre is filled with yellow stamens and reminds us of wonderful summer day. You might expect the huge buds of Cytherea to bloom into gigantic flowers, but – as the saying goes – appearances can be deceiving. Unlike other large hybrids, like Coral Sunset, Cytherea isn’t double-flowered, but single-flowered. 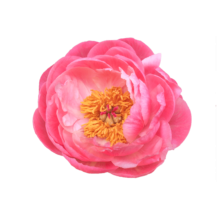 Cytherea is a single-flowered peony with bright pink petals that contrast nicely with the yellow stamens. The buds and stems of Cytherea look just like those of Coral Sunset. Cytherea is less plump though and lacks the unique colour transformation of Coral Sunset. Cytherea was registered in 1953 by Saunders. It was awarded the coveted APS Gold Medal in 1980. Despite this recognition, sales figures aren’t spectacular. That’s a shame, because the lovely Cytherea deserves a lot better! Single-flowered peony varieties are ideal for bouquets, due to their open centres and visible seeds, and the radiant Cytherea is no exception. Looking for a nice bouquet? Combine this wonderful peony with the Astrantia, the yellow Gloriosa and the blue Delphinium and get that summer feeling!